Lead is not normally found in drinking water at the source. 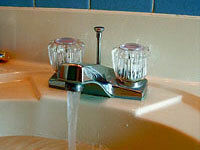 Typically, lead gets into your drinking water from the service lines, plumbing and fixtures that contain lead. As a result of corrosion, lead and other metals from the pipes slowly dissolve into the water. Many factors affect the amount of lead that leaches into the water, including lead content of pipes, fixtures, and solder, along with water temperature, pH and hardness. Lead is associated with adverse health impacts even at low levels, particularly in infants and children.